I love everything about fresh figs, really. The sweet stickiness that lingers on your lips, the earthy smell, the bright red flesh that offsets the crisp green or deep dark purple of the skin, the plump texture with just the right amount of crunch form the tiny seeds… I even like the shape of the bright green leaves and the knottiness of the tree branches. Let it be known that if I were to reincarnate as a tree, I’d like to come back as a fig tree. Mom must have loved figs too, because I remember us bringing back a few saplings during one of our vacations in the South of France. Mom carefully nursed them on our dining room window sill, where the afternoon sunlight would caress their tiny organic bodies and would cause their little leaves to quiver from the warmth. The next Spring, we planted two of them in the backyard, in a post-winter ritual involving partially decomposed dog doodoo and a rusty shovel (with possibly some canned banana shoved in the hollow handle) (*). We didn’t hold much hope for the saplings’ survival of the first brutal Belgian winter that would be nipping at their fragile roots come November, nor did we expect for them to thrive in our cold, wet climate. Despite all odds being stacked against them, these little knotty fig trees have grown to reach the edge of my mom’s single level’s rooftop over the years. Overwhelmed by the amount of fruit they’d produce every late Summer thru early Fall, we couldn’t keep up with the harvest and… well… let’s just say that the crows & squirrels of the ‘Jasmijnenlaan’ were well fed. (*) For more intriguing story lines of ‘canned bananas’, please read my banana butter post here. I realize that figs are expensive outside of Southern California. Lucky for me, however, I happen to live in a dry, sunny climate, similar to the Mediterranean where fig trees thrive. 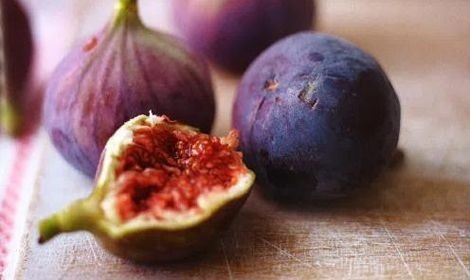 Even better is that ‘fig season’ actually comes in 2 installments… The first crop, named the ‘breba’ crop, grows from branches that sprouted the previous year and is the harvest that begins in late Spring. It’s a fairly short-lived season, usually with the last crops harvested around early Summer. The second & larger harvest, sprouting from this year’s branch growth, begins in mid-August and runs as late as October for some varieties. This means that, with a bit of clever pre-planned farmers market hopping, I can actually enjoy fresh figs with nary a hiccup through fall. Most of the figs around here are ‘Brown Turkey’ figs or ‘Black Mission’ figs, with the deep purple black mission fruit usually having a more intense fig flavor. Later in the summer, you see ‘Kadota’ figs and ‘Calimyrna’ figs. Kadota figs are used mostly for drying, but the bright green Calimyrna’s are excellent for eating raw as well. ‘Adriatic’ figs and striped tropical ‘Panachée’ figs are quite scarce over here, so if you see them, grab them. If you’ve never eaten fresh figs before, don’t be alarmed. When ripe, there are few fruits that compare to their sweet juiciness and I know you’ll love them too. Simply rinse the whole fruit, trim the stems back a bit and sink your teeth in like you would a strawberry. 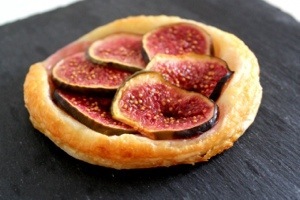 On the other hand, fresh figs are a treat when roasted in the oven with some goat cheese or chopped in salads, or you can bake them into a sweet or savory tart like I did below. Line a baking sheet with parchment paper and place 4 puff pastry rounds on top, spaced approx. 1.5-inch apart. In small bowl, soften goat cheese with some salt & pepper to taste, and the lemon zest. Divide goat cheese mixture evenly over the center of the puff pastry rounds, making sure to leave approx. 1 inch of the edges clear. Sprinkle chopped fresh oregano over the goat cheese. Place fresh fig slices over the goat cheese to more or less cover. Fold the edges of the pastry over themselves just a little bit, so you get a bit of a thicker edge on the outside. Bake the tartlets in the oven for approx. 15 min until the edges are puffed and the center looks caramelized and somewhat gooey. Drizzle some honey over the top and serve warm. Yum – that looks so tasty!